Original Bike Spirits is a brand of motorcycle products aimed at the cruiser market. The product line currently includes brake cleaner, chain cleaner, carb cleaner and a few other items. The Original Bike Spirits “Spray Cleaner & Polish” product has been heavily advertised recently in print magazines, so we gave it a try. 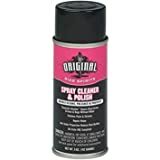 We categorized the Original Bike Spirits Spray Cleaner & Polish as a “Quick Cleaner” type in our database of motorcycle cleaner and polish reviews (see the full list and our ratings on our Motorcycle Cleaners, Waxes and Polishes Page). Some of these quick cleaners/polishes are in a liquid form, while others come in a spray can like the Original Bike Spirits product. Some are biased more towards cleaning while others seem to work better as polishes. Our current “Quick Polish” favorite,Tirox Speed Wax Detailer, is more of a polish and wax than a cleaner. Manufacturer: Automotive Products Group, Inc. Type: Spray can, 14 oz. and 5 oz. Category: Quick cleaner and polish. For Use On: Paint and chrome. To Apply: Spray on, buff and polish. Claimed Features: Polish, repels water, anti static and dust. 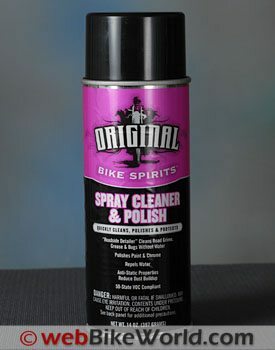 Some members from a local bike club said that Original Bike Spirits is sold under other brand names, specifically mentioning the Honda Spray Cleaner and Polish. I can’t confirm this and I haven’t tried the Honda product, but perhaps some webBikeWorld readers can confirm this. After using the product on a regular basis with several motorcycles during the past few months, I would say that the Original Bike Spirits Spray Cleaner & Polish is a good compromise between cleaning and polishing. I wouldn’t use a word like “outstanding” but I can perhaps rate it as very good. The “perfect” quick spray cleaner and polish has yet to be developed, in my opinion. Such a product may be theoretical and would instantly (or nearly so) dissolve dirt and baked-on bugs. It would then leave a “hard” waxy-feeling coating on the paint for protection, similar to what I get when I use the Tirox Speed Wax Detailer. And this theoretical best quick cleaner/polish would perform just as well on clear plastic windscreens as it would on paint and chrome. The Original Bike Spirits product is available in a 14 oz. or 6 oz. spray can. The 14 oz. can is the better bargain at $0.425 per ounce, versus $0.750 per ounce for the 6 oz. can when using list prices. The formula has a mild smell that is somewhat like bug spray. It sprays out as a slightly thin stream that is liquid enough to run if applied with anything but a very thin coat. I’ll have to assume this was by design, and I do think that the thinner consistency of the spray helps to loosen and break up dirt and bugs. But to keep it from running off a vertical surface, an immediate wipe is necessary to prevent it from dripping off the surface and to spread it around. The product seems to perform better if it’s left for 20-30 seconds or so to work in to the surface. Using a clean soft cloth (preferably a high-quality microfiber polishing cloth), the Spray Cleaner & Polish is then wiped and buffed from the surface. It does seem to take more buffing than other products I’ve tried to remove the Spray Cleaner & Polish, and when it’s almost completely buffed out with just a thin film left on the surface, I leave it again for about 30 seconds or so before the final buff. In other words, when you think you’re done, wait another 30 seconds or so and give it a final buff. The final buff-out (use a clean polishing cloth), takes a few more swipes than you’d think. The product does not leave the same type of “hard” feeling surface on (good quality) paint or clearcoat like the Tirox polish; instead, the Original Bike Spirits product leaves a sort of “waxy” feel to the surface, almost like the product hasn’t been completely removed, even after all the buffing. It does leave a very good shine though and I think the “waxy” feel may help to repel water. I’m not sure I’d use Original Bike Spirits Spray Cleaner & Polish or any of these quick cleaner products as a total replacement for a water and soap wash, despite what the manufacturers say. But generally speaking, the quick cleaners that are currently available have been pretty good products. I can’t remember the last time I did a full “traditional” clean and polish on any of my bikes. I just don’t seem to have the time or ambition for that and I’ve become a big fan of the quick ‘n’ easy types. Original Bike Spirits Spray Cleaner & Polish (L). The slightly thin liquid will run unless it is immediately wiped (R). Since it’s now 2010, we no longer have to use old T-shirts for polishing our motorcycles. Modern fabrics are available that are specially designed for the job. It’s best to use a high-quality micro-fiber cleaning cloth, like those designed for cleaning lenses; here’s a selection from Amazon.com . Original Bike Spirits Spray Cleaner & Polish is a very good product that seems to have about a 40/60 balance of cleaning/polishing performance. It’s relatively inexpensive for this type of quick cleaner/polish; it performs well and it seems to last longer than some of the other quick cleaner/polish products we’ve reviewed. From “S.G.” (09/10): “I am a longtime user of Honda Spray Cleaner and Polish, and this product sounds like it could very well be the same. I get much better results if I use one cloth for wiping on/cleaning and a different one for buffing. The dry cloth is key for buffing.